WDM (Wavelength Division Multiplexing) is a commonly used technology in optical communications. It is often deployed to join multiple wavelengths onto a single fiber. 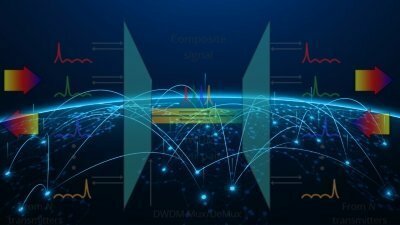 In the WDM system, there are two main types: Coarse Wavelength Division Multiplexing (CWDM) and Dense Wavelength Division Multiplexing (DWDM). Both CWDM and DWDM are available as active or passive systems. This article will focus on discussing the difference between them. CWDM is often employed in situations where only a few channels are needed and there is no need for distances longer than 70 km. The passive CWDM is an implementation of CWDM that uses no electrical power. It divides the wavelengths by passive optical components like bandpass filters and prisms. Most CWDM devices are passive. CWDM Mux Demux is the most commonly used device in the passive CWDM system. DWDW technology is used for long haul optical transmissions. It can be divided into two different versions: an active solution and a passive solution. The active solution is a good fit for applications involving more than 32 links over the same fiber. Passive DWDM solutions have fewer active elements, in other words, the solutions have higher reliability and less latency. In a passive DWDM network, the line functions only due to the use of the optical transceiver. Passive DWDM systems allow to arrange a high-speed system with high channel capacity, but the transmission distance and management are limited. The major applications of passive DWDM system are metro networks and high-speed communication lines. Passive DWDM and CWDM are based on the same concept of using multiple wavelengths of light on a single fiber. Both of them require no power and are easy to employ. However, they still differ to each other in some aspects. 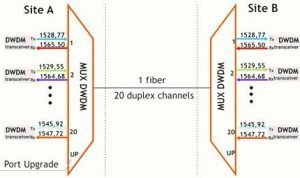 The following will describe some differences between passive CWDM vs DWDM. Passive CWDM transports up to 18 wavelengths (from 1470nm to 1610nm) with a channel spacing of 20nm. While passive DWDM can accommodate 40, 80 or up to 160 wavelengths with a narrower wavelength spacing of 0.8nm, 0.4nm or even 0.2nm. Its wavelengths are from 1525nm to 1565nm (C band) and 1570nm to 1610nm (L band). Passive DWDM supports more channels than passive CWDM. The former can provide up to 80 channels while the latter just supports up to 18 channels. The maximum reach of the passive CWDM is about 160 km. Although the passive DWDM system has no optical amplifiers to achieve a fairly long distance, it can reach longer than the passive CWDM. Actually, the cost is associated with the deployment of the system. In general, passive DWDM devices are more expensive than that of passive CWDM systems. 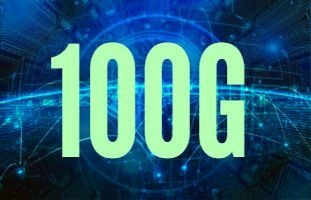 But the passive CWDM is just cost-effective for the connection rates below 10G and for short distance. After the comparison of passive CWDM vs DWDM, we can see that each one has its advantages and disadvantages. Which to deploy depends on the actual needs. Hope what we discussed in the article could help make an informed decision.